. DNS is the system that translates an easy-to-remember name like www.google.com to a numeric address like 74.125.45.104. These are the IP addresses that computers use to communicate with one another on the Internet. By returning different addresses to requests coming from different places, DNS can be used to load balance traffic and send users to a nearby server. For example, if you look up www.google.com from a computer in New York, it may resolve to an IP address pointing to a server in New York City. If you look up www.google.com from the Netherlands, the result could be an IP address pointing to a server in the Netherlands. Sending you to a nearby server improves speed, latency, and network utilization. Currently, to determine your location, authoritative nameservers look at the source IP address of the incoming request, which is the IP address of your DNS resolver, rather than your IP address. This DNS resolver is often managed by your ISP or alternately is a third-party resolver like Google Public DNS. In most cases the resolver is close to its users, in which case the authoritative nameservers will be able to find the nearest server. However, some DNS resolvers serve many users over a wider area. In these cases, your lookup for www.google.com may return the IP address of a server several countries away from you. If the authoritative nameserver could detect where you were, a closer server might have been available. Our proposed DNS protocol extension lets recursive DNS resolvers include part of your IP address in the request sent to authoritative nameservers. Only the first three octets, or top 24 bits, are sent providing enough information to the authoritative nameserver to determine your network location, without affecting your privacy. The Internet-Draft was posted to the dnsext mailing list today, and over the next few months our group hopes to see this proposal accepted as an official Internet standard. We plan to continue working with all interested parties on implementing this solution and are looking forward to a healthy discussion on the dnsext mailing list. Today a group of DNS and content providers, including Neustar/UltraDNS and Google are publishing a proposal to extend the DNS protocol. DNS is the system that translates an easy-to-remember name like www.google.com to a numeric address like 74.125.45.104. These are the IP addresses that computers use to communicate with one another on the Internet. 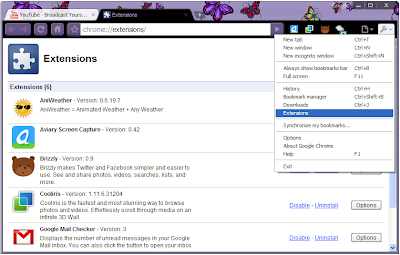 Extensions -- previously available on Google Chrome for Windows on the beta channel -- and are now available to all users. Extensions enable you to provide additional functionality not just on your site, but to bring content and functionality from your site into the browser regardless of what sites the user has open. Google Chrome extensions use the same multiprocess technology that makes the browser fast and more secure, so that extensions won't crash or slow down your browser. , Google Docs now allows users to upload any type of file! Over the next couple of weeks we’ll be rolling out the same feature in the Documents List Data API. For now, uploading arbitrary files via the API will be restricted to Google Apps Premier domains. For starters, each user gets 1GB of storage with a maximum size of 250 MB per file. , which we introduced at I/O 2009, where developers from more than 100 companies will be on hand to demo their apps, answer questions and exchange ideas. We'll be regularly adding more sessions, speakers and companies on the event website, and today we're happy to give you a preview of what's to come. Over half of all sessions are already listed, covering a range of products and technologies, as well as speaker bios. We've also included a short list of companies that will be participating in the Developer Sandbox. For the latest I/O updates, follow us (@googleio) on Twitter. Today's registration opens with an early bird rate of $400, which applies through April 16 ($500 after April 16). Faculty and students can register at the discounted Academia rate of $100 (this discounted rate is limited and available on a first come, first serve basis). Last year's I/O sold out before the start of the conference, so we encourage you to sign up in advance. I'm excited to announce that registration for Google I/O is now open at code.google.com/io. Our third annual developer conference will return to Moscone West in San Francisco on May 19-20, 2010. We expect thousands of web, mobile, and enterprise developers to be in attendance. I/O 2010 will be focused on building the next generation of applications in the cloud and will feature the latest on Google products and technologies like Android, Google Chrome, App Engine, Google Web Toolkit, Google APIs, and more. Members of our engineering teams and other web development experts will lead more than 80 technical sessions. We'll also bring back the Developer Sandbox, which we introduced at I/O 2009, where developers from more than 100 companies will be on hand to demo their apps, answer questions and exchange ideas.